•PAYING last respects to Rhumba icon Papa Wemba. A FEW days ago, one of the world’s acclaimed Rumba giants Papa Wemba was put to rest at a flamboyant funeral procession in the DRC capital Kinshasa. One would have mistaken this funeral for a presidential memorial if not one of those who politically matter a lot, but wasn’t he? On the actual day of his burial hundreds and thousands of Congolese fans lined up the streets while a large crowd gathered outside Notre Dame cathedral where the city’s Catholic archbishop celebrated a funeral mass. Truth be told, the Congolese rumba king’s popularity and respect he commanded among the fans and just across the world was simply unmatched such that his demise shook the entire globe. In Zambia hundreds of Congolese nationals and rumba musicians gathered in different places to pay their tribute to the late king of rumba. A check at Chez Ntemba VIP Lounge in Kabulonga of Sunday found hundreds of fans dressed in flamboyant attire the way he used to, enjoying his music that played for the whole day. Now, prior to his burial and according to some information reaching Chez Ntemba Entertainment, from Kinshasa, a special memorial ceremony was held for the 66-year-old in Abidjan, three days after his death. His wife, close family and friends, musicians and politicians were among those who availed themselves to celebrate the life he lived. 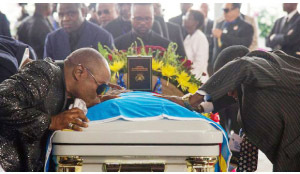 His body was however flown to the DRC accompanied by the Ivorian culture minister and musicians who handed the remains to the DRC Prime Minister Augustin Matata Ponyo.